Roger Gros is the president of Casino Connection International and publisher of its monthly Global Gaming Business magazine, the leading trade publication for the gaming industry. CCI also publishes a magazine previewing G2E, the annual global gaming expo, which Gros has served as a consultant since he helped organize it in the fall of 2001 in Las Vegas. COURTESY Niche gaming publicher Roger Gros helped organize G2E in 2001. This year the show will be held Sept. 27-29 at the Sands Expo and Convention Center. Roger Gros wanted a career as a musician 40 years ago. When that didn’t pan out, he found a good backup plan and hasn’t looked back since. The 65-year-old Gros is the president of Casino Connection International and publisher of its monthly Global Gaming Business magazine, the leading trade publication for the gaming industry. 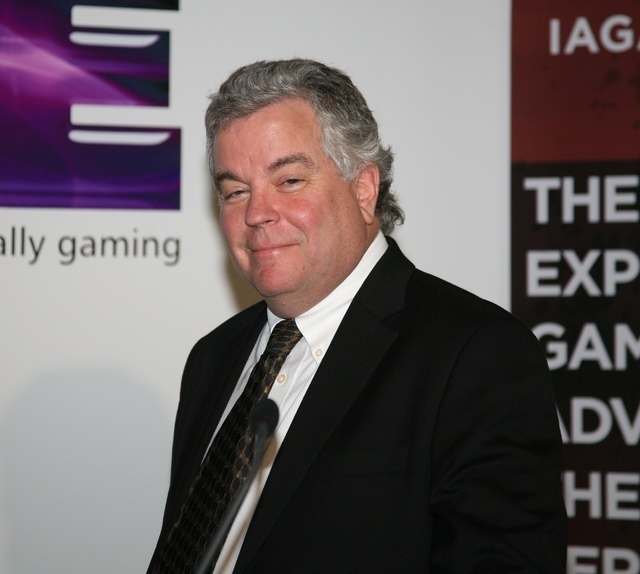 CCI also publishes a magazine previewing G2E, the annual global gaming expo, for which Gros has served as a consultant since he helped organize it in the fall of 2001 in Las Vegas. The Brooklyn native played in a band after high school and wanted to be a rock star when he moved to Atlantic City after New Jersey voters legalized casinos in 1976. His band wanted to play in casinos, but the casinos wanted a cover band rather than one that played its own music. Gros wound up becoming a dealer at Caesars Atlantic City when it opened in June 1979. Four to five years into his job, he began writing about the industry for an employee newsletter called Casino Journal, thus launching a career in the journalism industry. Gros left Caesars to work at the Golden Nugget Atlantic City, which recruited him as a baccarat dealer. Gros said he got to know the company’s owner, Steve Wynn, “a little” because he dealt to Wynn’s biggest players. Casino Journal had transitioned into a monthly trade journal by that point, and Gros decided to venture into journalism on a full-time basis under publishers and brothers Glenn and Adam Fine. They started Casino Player, a monthly consumer magazine that remains in existence today, and the National Gaming Summary newsletter, a recap of the news. It didn’t stop at publishing. The Fines started the American Gaming Summit in 1995, a high-end conference that Gros helped launch and held in Las Vegas every January. The company also sponsored the Southern Gaming Summit, the Northern Gaming Summit and Casino Ops, a conference co-sponsored by UNLV. In November 2000, the Fines sold Las Vegas-based Casino Journal Publishing Group to GEM Communications. It was reported in 2000 that some of GEM’s motivation in acquiring the company was competition from the American Gaming Association’s decision to start an annual gaming expo in Las Vegas. At the time, GEM sponsored the World Gaming Congress and Expo, which was touted as the gaming industry’s leading conference. Gros, who was vice president at Casino Journal, said he didn’t want to work for the new owners and instead decided to launch his own company and publish his own magazine. And since he was going to write about the employees in the Las Vegas market, he decided to move to Southern Nevada. Today, he lives in Boulder City most of the year and spends his summers in Atlantic City. The publishing venture started when Gross served as a consultant for the founding of G2E, a venture of the AGA and Reed Exhibitions. The new company launched Casino Connection in Atlantic City and a branch in Las Vegas, monthly publications geared toward employees. They folded following the recession because of advertising cutbacks. Gros launched an annual publication called Casino Design, which was later renamed Casino Style. It focuses on construction and design and nongaming elements of the casino industry. Tribal Government Gaming is published once a year, and GDB News is a weekly online newsletter. G2E Preview comes out a month before the annual trade show. Going into journalism and publishing was a melding of interests — developing businesses and writing, Gros said. Casino Connection International has about a half-dozen employees based in Las Vegas and a few staffers across the country. Gros said he’s not planning on retiring anytime soon with two of his five children in college and one in high school. His company is a family affair with his wife, Becky Kingman-Gros, serving as chief operating officer. She’s in charge of sales staff and finances, while Gros said he focuses on the editorial product and serving as the face of the company. When G2E was launched, Gros as a consultant helped put the conference together and chose speakers and topics. It was considered risky to go against an established trade show at the time, but when the AGA, which represents operators and manufacturers, is in your corner, the chances of success are good, Gros said. “The other show was owned by an independent company and all of the gaming companies were pouring their money into that, and this way the AGA was the beneficiary of the conference and they made money on it,” Gros said. “It worked much better for the industry. The first G2E didn’t come off as expected, Gros said. It was challenging because it came a few weeks after the 9/11 terrorist attacks when everything had come to a “screeching halt,” Gros said. The first show attracted 10,000 people, lower than expectations. The show typically attracts 25,000 to 30,000 people, and Gros said he expects attendance to be higher this year since the Great Recession is history and the economy continues its recovery. There are more products available, including skill-based slot machines, he said. Gros has jumped into the gaming industry in other ways than publishing. In 2013, he launched iGamingPlayer.com, one of the first American affiliate-marketing partners for online gaming active in the U.S. market, working with such companies as Caesars Interactive, 888, Borgata and Betfair. Gros said he has been covering online gaming since it started in the late 1990s, and the affiliate marketing firms are companies that drive players to the online casinos and have been successful in Europe. They have used what he called “sketchy and underhanded methods” such as spamming people that you can’t do in the U.S. and its regulated market. Gros is the author of “How to Win at Casino Gambling,” published in 1996, which sold about 125,000 copies. He said he’s considering a follow-up, especially after he was told by Las Vegas author and publisher Anthony Curtis that it was the second highest-selling book of its type behind Edward Thorp’s “Beat the Dealer” published in 1962. “I don’t know if that’s true, but I like to tell that story,” Gros said, laughing.